Oncealed s trap outlet for greater aesthetics water saving 6/3 dual flush technology matches well with rhine basin with short pedestal 220 mm distance from centre of outlet to the wall. Available in pergamon pearl and glacier white. 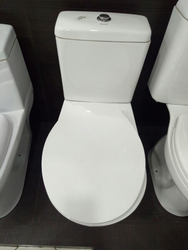 With vast industrial experience, we are involved in offering a wide range of Water Closet.